To further interest in and information about the hobby of collecting ink bottles, every now and then my wife and I will post some information about a specific ink bottle or company. This will be accompanied by a picture or more taken from our ink book, INKS - 150 Years of Bottles and Companies, 2nd Edition. More info will usually be found in the book (the book is now no longer being produced due to the cost and time consumed with self-printing). See the note at the bottom of this page). Sanders or sand shakers were used from early 17thcentury until paper ink blotters became popular in the latter half of the 19thcentury. Every home or office needed one to blot the ink as quills and nib pens left ink on the paper. Even early fountain pens left ink that needed blotting to help it dry quickly. After the sand absorbed or dried the excess ink, it was poured back in the sander. Most had a concave top with a star-shaped formation of holes. Sanders were made in glass (colored and clear), all kinds of wood, silver, tin, hard rubber, and many more materials. The expensive wood ones were highly polished. Cheaper were tin or wood. All the traveling desk sets had a matching sander and inkwell. These make an interesting go-with for ink bottle collectors. 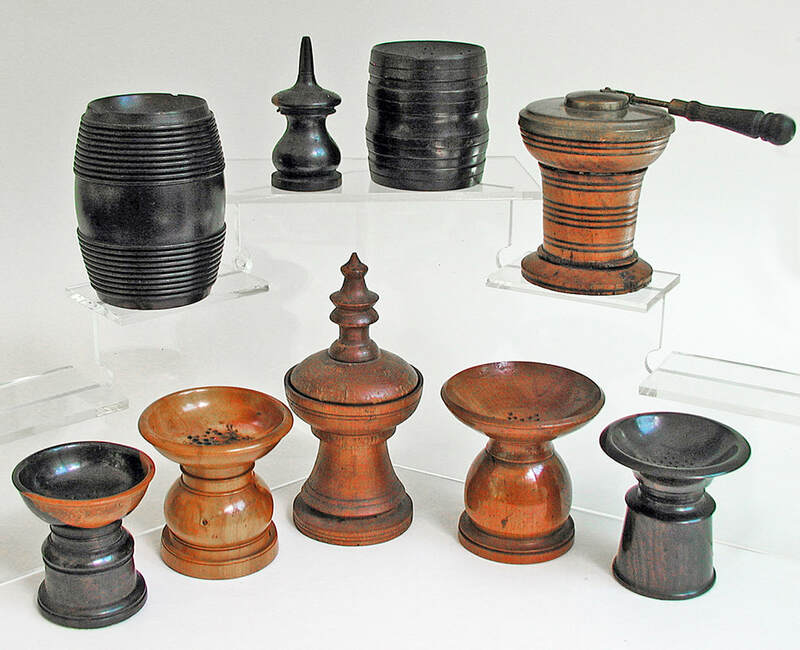 ​The S. Silliman of Chester, Connecticut made high quality wooden products such as the desk and school inkwells, wafer cups, and sanders. Pictured is a circa 1854 price list of their products. These inkwells are still seen today and just have a paper label for identification. Penmanship was considered very important in the 19th century. Business colleges had classes just for that and included in the writing classes were drawing techniques. Many beautiful drawings came out of these classes including the one pictured from the Gem City Business College, Quincy, Illinois. Pictured above are writing accessories of the early 19th century. 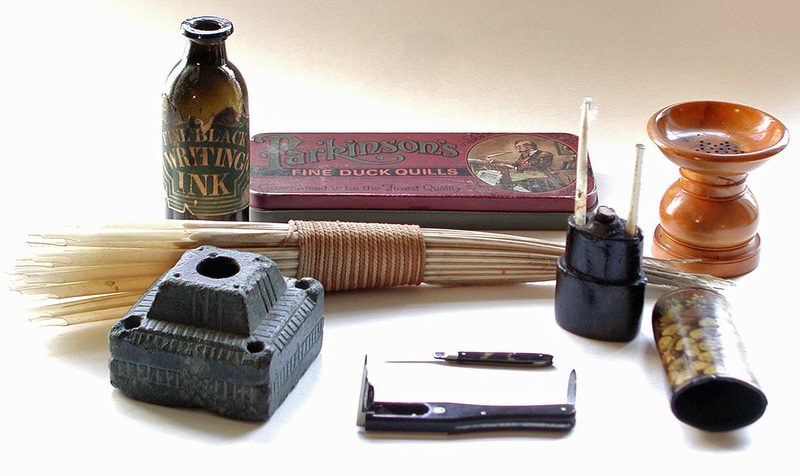 Pictured is an early pontiled ink, a pack of feather quills, a tin box that contained duck quills, a soapstone inkwell, a traveling or pocket inkwell with small corked bottle and two original quills, a pocket quill cutter and pen knife for trimming quills, and a sander for sprinkling fine sand to dry the ink. Apollos W. Harrison is best known for his ink products from the 1840’s to early 1870’s. However, most of the advertising was for his perfumery products which included cosmetics of all types, and especially hair dye. His bill heads specified both ink and perfumery. The box pictured below is from the late 1840's and is very flimsy. The ad on it is newsprint and very fragile now. Ephemera from his ink company is hard to find, however some trade cards exist from the cosmetic division. An interesting fact on the early boxes is that another ink maker got so disgusted with the fact they couldn’t support his products, he invented and patented his own design in 1855. This design proved so popular that other companies wanted his boxes. He ended up building his own paper box factory and concentrated on that rather than his ink and druggist business. Who was this ink maker? Elisha Waters of Troy, NY. 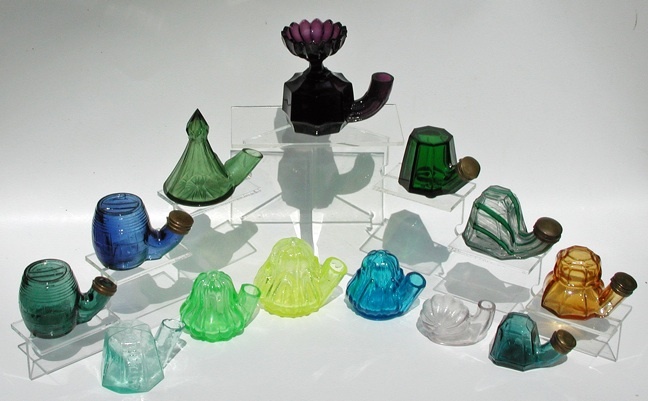 Teakettle inkwells can be found in many beautiful colors and shapes, as well as clear, ceramic and pottery. Embossed glass ones are rare. Some of the pottery will have an advertising name on them. Occasionally one can be found with the English ink company name on a brass medallion fitted to the top of the bottle. The embossed American one we see most often is the aqua one with pen ledges and a patent date. Also pictured in this group is an aqua Butler’s ink which is considered hard to find. The barrel inks are thought to be American, whereas the others are of unknown maker for the most part. The figural ones such as snail, turtle, etc. are thought to be European. The problem with identifying the maker or ink company is that without embossing of any kind, the only way to know would be pictures from a glassmaker’s catalog or an old ad. I haven’t seen any pictured in a catalog. The only old picture I have seen is a ladies fashion plate picture dated 1839 in William Covill’s ink book. Dates are unknown with a lot of disagreement. The ladies’ fashion picture in Covill’s book is from 1839 and shows a teakettle ink. A lot of today’s “experts” say teakettles date to the 1870’s to 1890’s. My thought is earlier because of Covill’s picture. But until someone finds proof either way, who can say. Even though we can’t prove maker or actual date, they are 19th century at any rate and make a beautiful collection. UPDATE: An avid teakettle collector, Joe Mathews, saw the post below and sent it to me confirming information that teakettle inks were indeed made as early as the 1830’s in England by S. Mordan. 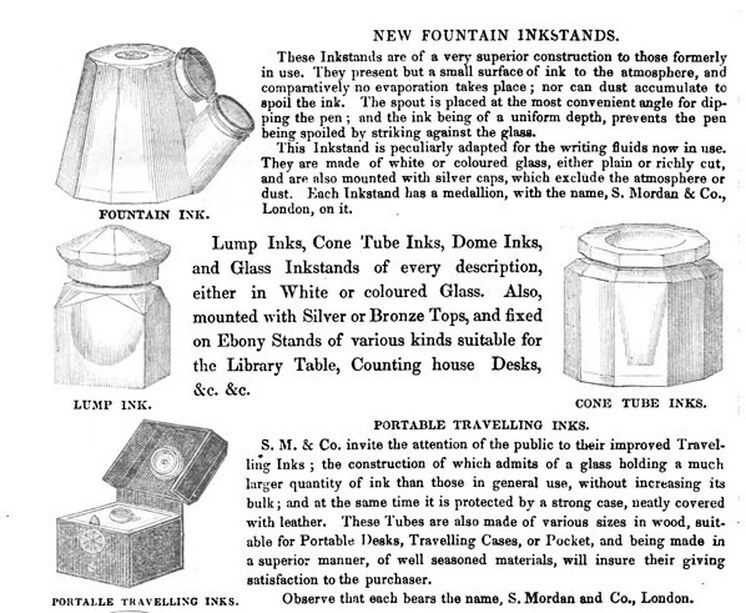 There are a number of ads by this company promoting the newly designed inkstand called the Fountain Inkstand. One from 1835 shows a picture and it is clearly what we call a teakettle. So with this new information, it looks like this design was made for at least 50 or more years from early 1830’s until 1885 or so. The ad is pictured below. No doubt other companies used similar inkstands, but this is the only ad I have found so far, other than in Covill’s book. This is from a publication printed in 1835 London. Antique Ink Bottle Book - The second edition of our ink book is not currently available. It is the result of years of research and picture taking: "INKS - 150 Years of Bottles and Companies, 2nd Edition" by Ed and Lucy Faulkner. It is 320+ pages full of more than 1500 color bottle pictures, company histories and go-with's of all types (it is NOT a price guide). Production is very limited. I regret that due to increased toner cost and postage the price is $125.00 ppd. There are currently NO copies available (7/25/2018).